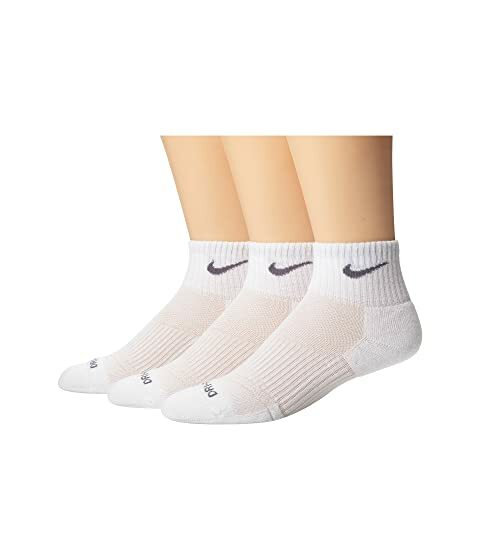 No matter what you're up to, you'll enjoy the comfort of these quarter socks by Nike®. Dri-FIT technology wicks moisture away from your skin to keep you cool and dry. Full terry cushion acts as a shock absorption pad. Arch support offers added stability. Reinforced heel and toe provides enhanced durability. Designated left/right for an anatomical fit. 51% polyester, 31% nylon, 16% cotton, 2% spandex.